This month's Paper Chef is hosted by Alessio from Recipe Taster. If you are new to this fabulous food blog game, here are the basics: Each month, usually on a Wednesday and with appropriate fanfare, four ingredients, or three ingredients and a theme, is randomly chosen by the previous month's winner. All the participants scurry to their kitchens and start cooking up a storm, to have a fabulous recipe ready by the next Tuesday. The winner is chosen by the previous winner, he, or she, choses the next four ingredients, and so on and so forth. Alessio's random ingredients turned out to be flour, cranberries, candied orange peel and dried dates. She challenged us to try and come up with a savoury dish, a challenge I considered for a while, and then ignored in favour of this chocolate cake. I did initially wanted to do something savoury, but with my limited imagination couldn't come up with anything. It's the candied orange peel that got me. I tried to think in the direction of a tagine of sorts, but I don't think candied orange peel is a welcome guest in the tagine menagerie. These thoughts did remind me of a very interesting recipe I came across a while ago: candied olives, and the first recipe Google told me about here, did indeed contain orange peel. Another recipe combined the olives with chocolate tart, and I was sold. To me chocolate tart or cake is the culinary version of the little black dress - it goes with everything, so it was easy enough to incorporate dates and cranberries. Except (of course there has to be an "except"), I didn't feel like dried cranberries. I looked for recipes I could use cranberry juice in, but nothing really that caught my eye. Plan B was cranberry jam, and I remembered vaguely a Nigella recipe using marmalade. This is a fabulous cake I used to make cake all the time. It's dead easy, and everybody always loves it. So all I did was swap the marmalade with fancy cranberry jam from our local deli and add some chopped up dates. "Yum" is all I need to say about that. The final verdict: loved it. Somehow the combination of the sweet chocolate, tart cranberries, sweet-salty olives and the orange peel blended like a charm. I was worried that it will all be just too much, but my (admittedly unsophisticated) palate disagreed. Saying that, I don't think I will be making this for anybody. Reading some comments about candied olives showed me that even people who call themselves foodies can be pushed too far. My limit being the fairly-edible-for-some tofu, I grant people the candied olives. But I am very keen to make them again. Put all the ingredients into a fry pan and let the sugar melt and then put them into an oven and roast at a slow heat, 100°C, for about an hour or two, or until dried. Let cool. Preheat your oven to 180°C. Butter a 20cm cake tin and line with baking paper. Put the butter in a heavy-bottomed saucepan and put over a low heat to melt. When it's nearly completely melted, stir in the chocolate. :Leave for a moment to begin softening, them take the pan off the heat and stir with a wooden spoon until the butter and chocolate are smooth and melted. Now add the cranberry jam, dates, sugar, salt and eggs. Stir with wooden spoon and when all is nicely mixed, or "amalgamated" in Nigella-speak, beat in the flour bit by bit. Put into your prepared tin and bake for about 50 minutes or until done. Cool in the pan on a rack for 10 minutes before turning out. 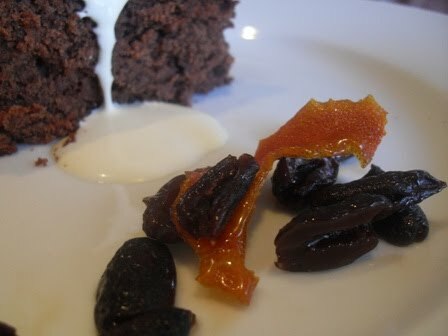 Serve with some whipped cream and some of the candied olives and orange peel. Pass this cake my way please. Wonderful combination of these ingredients. Wow, yammy! That sure sounds like a great cake. And I do love the olives! I also tried to do something with, and, fit olives into my dish, but I couldn't this time. Way to go Adele! Love candied olives! That sweet/salty combo gets me every time.